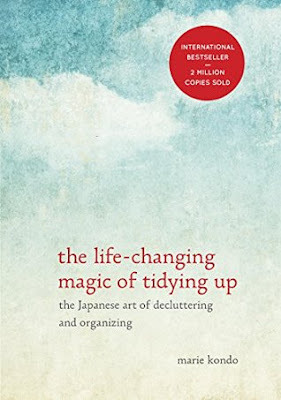 I believe Modern Mrs. Darcy's review of The Life-Changing Magic of Tidying Up is what first brought the book to my attention. She discusses Kondo's basic approach to tidying, and I was so intrigued. A lot of what I was reading made sense, but I wasn't sold yet. Then, I kept seeing the book everywhere! When Rachel from Hello, Chelly wrote about her experience tidying with Kondo's method, I knew I had to try it for myself. I like non-fiction, but I don't typically read self-help books. But I do love organization (as you might know if you read my blog), and I'd heard such great things. When I finally picked it up, I was able to finish the book the same day. It's a quick, short read - though you may find yourself referring back to it during the tidying process. After reading the book, I was very motivated to get started! I explained the process to Nick, and he was on board. We're both neat people, and I can honestly say that we didn't think we'd have much to clean out. Well, we were wrong. While I didn't follow Kondo's method to the letter (more on that in a bit), we still ended up discarding so much. We threw away at least ten trash bags of stuff, took seven moving boxes worth of stuff to Goodwill, and I had two big boxes of clothes to donate to a local organization. It was insane! I thought I'd cleaned out before, but this book made me approach it in a new way. "People cannot change their habits without changing their way of thinking." For Kondo, it's not just about her system of tidying up. She's got rules to follow, of course, but she ultimately wants to change your habits. The ultimate goal isn't just to clean up your house or get rid of stuff. She wants to change the way you think about what you own and what you acquire. I loved this aspect! "Putting things away creates the illusion that the clutter problem has been solved." I've definitely fallen victim to the idea that more storage leads to better organization. Kondo totally challenges that idea, and I found myself agreeing with her. If you have too much stuff, you won't solve the problem by finding new ways to store it. You're just perpetuating the problem, and your house won't feel any tidier. "We should be choosing what we want to keep, not what we want to get rid of." This was a very different approach for me! I'm usually going through stuff and trying to decide what to discard. But Kondo wants to make one simple, but meaningful, change: decide what you want to keep. Ask yourself if something sparks joy, if it still has a purpose and if it's something you want to keep in your home. Kondo tells you to ask "Does this spark joy?" with every item in your home. At first, I thought it sounded cheesy. But the more I thought about it, the more I realized the value of the question. If I want to be surrounded by stuff that makes me happy, I have to discard the things that don't. I don't want to keep things "just because." "The best sequence is this: clothes first, then books, papers, komono (miscellany), and lastly, mementos." Rather than sort by room, Kondo believes you must sort by category. I've always tidied by room, but now I understand the drawbacks of that method. I loved when Kondo explained when you needed to go through categories in a specific order. I'll explain what I mean with the quote below! "People have trouble discarding things that they could still use (functional value), that contain helpful information (informational value), and that have sentimental ties (emotional value). When these things are hard to obtain or replace (rarity), they become even harder to part with." Kondo wants you to start with the easiest category to tidy and then work towards the more difficult categories. For example, clothes are easy because they don't have emotional or informational value, and they aren't hard to obtain or replace. Mementos are the hardest because they're sentimental and rare, so it takes longer to sort. "To truly cherish the things that are important to you, you must first discard the those that have outlived their purpose." Kondo believes we do a disservice to the things that we love when they're surrounded by things that we no longer need. I knew exactly what she meant! For example, I had a bunch of clothes that had outlived their purpose - and yet I wore those more often than the stuff I loved just because they were there. "But when we really delve into the reasons for why we can't let something go, there are only two: an attachment to the past or a fear for the future." This was one of the most memorable parts of the book for me! If something doesn't spark joy, why am I keeping it? Kondo argues that it's out of fear. We're either too attached to the past ("I used to love carrying this purse!") or afraid of the future ("What if I need to use this again one day?"). I don't want to keep things out of fear. That being said, I didn't follow all of Kondo's advice. There were a number of things that I ignored, such as thanking your items, emptying your purse every day, not keeping anything in the shower, etc. One of the biggest categories where I broke the rules was books. Generally speaking, Kondo doesn't recommend keeping many books because 1) you likely won't re-read and 2) if you haven't read it yet, you won't. There's wisdom in what she says, and I did reduce my TBR using her method, but I didn't completely follow it. Books bring me joy! There were a few other things I chose to disregard, but I'd still recommend this book. For me, Kondo truly accomplished her purpose. The Life-Changing Magic of Tidying Up made me think differently about the things I own, and I have a feeling it's going to change the way I think about what I acquire. My home makes me so much happier now - it just feels like everything is where it belongs. And I plan to be smarter about what I bring into my home because of it. I want to continue to love the place I live! "Too many people live surrounded by things they don't need 'just because.'" OH MY GOSH!!! I'm so excited you read this book! I shove this book on practically everyone. I used to love "organizing" and had no idea how much stuff I owned. Let me tell you, it was a lot of crap. I now have a teeny tiny wardrobe that would have horrified me a few years ago, but it's so easy to get dressed in the morning and everything fits me perfectly because I only kept what I loved. I also kept a lot more books than she recommends, but not because I think of it as "breaking the rules." I often re read books I love and books bring me an immense amount of joy. Also, sometimes it takes me time to get to my TBR list, but generally I get around to most books I bother purchasing since I tend to purchase classics most. I also ignored her bits on thanking your items, but I did embrace the idea behind it. It made it so much easier to get rid of things that were gifts or sentimental items or just items purchased when I was in a bad mood. It helped to recognize that I wasn't "wasting" them, but that their use in my life was to bring me some momentary happiness. I didn't have to hold onto them anymore. It was so freeing to get rid of so much stuff I didn't know was stressful to have around and I'm way more productive at home now. Seriously. This book is amazing. I'm obsessed. End of story. This is a very helpful review of this book! I have heard a lot about it, but the quotes are really useful to see how this is about changing your thoughts, not just "honoring" items or touching things to find out if they bring joy. I need to do some major reorganization at home, so maybe it is time I check this one out. Even if I don't, the bits you posted are helpful starting points. Yes, yes, yes. I have become a crazy person when it comes to this book (and have probably butted into more Twitter conversations than is polite as a result). While some of the things Kondo proposes are strange or just impossible to implement I think the approach is sound and I love that the book is more about learning how to think about organization and finding what you can take or leave. I read the book a few months ago and I don't know if I'll ever review it but just in that time I can tell I've started thinking about things differently. And the areas I really did get through tidying (clothes and handbags especially) have NOT reverted to their usual mess which is a HUGE milestone for me. If I had to pick one book to obnoxiously make everyone read, it might be this one. I read this book and loved it! I recommended it to everyone I knew. I thought that because I live in a tiny apt that I wouldn't have that much to get rid of but I was wrong. I got rid of like 15 bags worth of stuff. My apt looks and feels soooo much better. I really do want to read this book! I'm a stickler for organization, and just have to comb through our entire household every quarter to "clean" and to make sure we're only keeping things that are important to us. (This is not, by the way, a philosophy Macky or my sister Mel share with me.) I'd love to see what her methods entail, and see what I can learn from her process! Plus, I'm always up for a good clean. Lovely review, Hannah!